According to the Intergovernmental Panel on Climate Change, Africa is one of the most vulnerable continents to climate variability and change due to its high exposure to climate shocks and stresses (e.g., droughts) and relatively low adaptive capacities. In sub-Saharan Africa (SSA), more than 65 percent of the population derive their livelihood from rain-fed agriculture. This makes the rural economies in SSA especially susceptible to weather and climate. 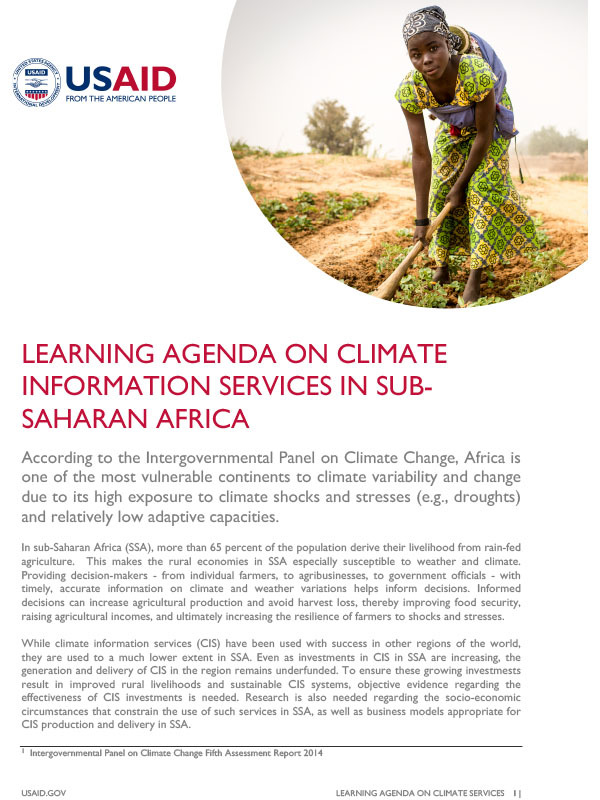 Providing decision-makers – from individual farmers, to agribusinesses, to government officials – with timely, accurate information on climate and weather variations helps inform decisions. Informed decisions can increase agricultural production and avoid harvest loss, thereby improving food security, raising agricultural incomes, and ultimately increasing the resilience of farmers to shocks and stresses.